At 3:30 AM I finally finish a really bad Agnes scene, but at least it’s finished, and then I read ahead to Bob’s next scene and he’s done the exact same things. And I turn to the e-mail computer to tell him it’s his fault so he knows when he wakes up in the morning, and before I can hit send, I’m getting e-mails from him, which he’s writing thinking I’ll be getting them when I wake up. So at 4 AM, Bob and I are arguing about what the hell happened that we got our signals crossed (except now I know it’s my fault for not reading ahead first). And we have a phone interview to do at 11 this morning, so we really need to get to bed. But instead, we type at each other. We really need to get lives. And of course, in the meantime, Mare languishes. And tomorrow I head for NYC where I’m not positive I’ll have an e-mail connection. So possibly this was not the best time to do the 12 Days of Mare. Dark brown, almost black, with navy streaks in it, the kind you can’t see until you’re up close. Yes, really navy, she added them. Working on this. Back to you later. Vintage stuff. 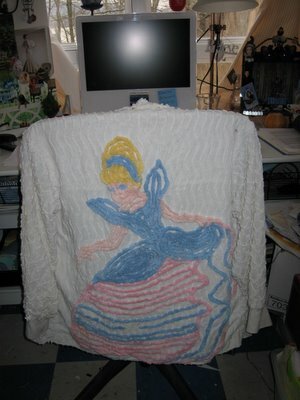 White poufy prom dress with the bottom eighteen inches of the crinoline cut off so people can see through the bottom of the skirt, worn with a black cardigan and black heart-shaped sunglasses with rose-colored lenses, black flats. Plaid school uniform skirt with white tank top that says “Mother’s Tattoos,” knee socks, Keds. Black capri pants with black flats and a Mickey Mouse baseball shirt (the kind that buttons up the front). Levis (regular cut) with white lace camisole and white chenille jacket made from her bedspread from when she was a little girl with a large Cinderella done in chenille that was the center medallion on the bedspread on the jacket back. Since they move so much, she keeps every room the same. She’s been buying up vintage curtains for years, so she just hangs them from the walls in every room she gets. Most of them are in blues and greens and lavenders, in velvets and silks, and a lot of them are worn and motheaten, but she hangs them in folds so you can’t tell. Her room always looks like an underwater tent. She has a iron day bed with curlycues on the ends, and she has it covered with a bedspread she’s had since she was a child and there was money, a beautiful stripped silk coverlet in gold and blue and lavender. Lots of gold and green and blue and lavender and black velvet, silk, and satin throw pillows she’s found at Goodwill or thrift stores or made from curtains that were too worn to hang. Lots of them. A big cushy purple pillow on the floor in front of the window for Pywackt, so he can sleep in the sun during the day. At night, he sleeps on the daybed with her. The bedside table is more wrought iron, an old outdoor table she sanded the rust off of and painted lavender. Her lamp is pink glass and it has a gray silk shade edged with pink feathers. The rug on the floor is an old oriental, navy faded almost to gray. Holes in places. She pins pictures from magazines, posters, etc to the hangings on the wall, changing them out when she gets tired of them or they’ve completed whatever thought she hung up there to inspire. 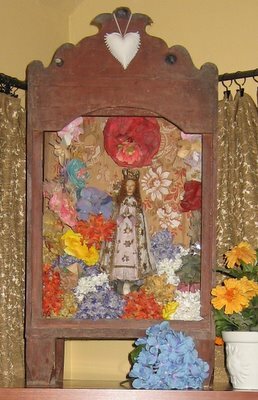 Her one extravagance is South American nichos of the Virgin of Juquila, little homemade shrines that she buys on eBay. She has six of them, including one big one that wiped out a week’s salary. She calls her Biggie J and adds a flower (silk) to the shrine whenever she wants something really important. She doesn’t have a bureau, just stacks of old suitcases that look like freeform bureaus that she’s collected over the years. Her favorite is a complete set of sixties pink luggage, but most of it is forties mid-sized suitcases in the yellow-brown color that was popular then. She has one big reading chair that she dragged home from Goodwill and patched over the years with pieces of curtain material so now it has a custom patchwork/crazy quilt look, all in those deep water colors, plus she adds anything else that catches her fancy now: weird buttons along the sides, scraps of lace and doilies. She learned to transfer photos to fabric, and she’s now thinking of how she can put the family photos on the back, like a gallery. And last year she added a big footstool which is in the process of being recovered, too. She has books and notebooks and sketchbooks and CDs scattered all over, but her Mac laptop is always stowed carefully under her bedside table. Her iPod, a Christmas present from Dee and Lizzie three years ago, is always with her. And she lines her shoes up along the baseboards of whatever room she’s in, so she can see them in all their glory, although her shoes are nothing compared to Lizzie’s. Sometimes she goes into Lizzie’s room just to stare at the glory that is Lizzie’s shoes. Walking. She walks everywhere because she needs to see everything. Mare really is about the journey, not the destination. Can’t. Too easy to track them down. But she buys The Week every week. The Uninvited by Dorothy McCardle. After that, anything by Terry Pratchett. Buffy reruns and Veronica Mars, although she has a real fondness for My Name is Earl. Romantic Black Comedy. Fave: the fabulous Grosse Point Blank. Also loves A New Leaf. Prizzi’s Honor. Thinks Mr and Mrs Smith was over-hyped. Faboo. Your mileage may differ. Jeez. Movie star crush: As in, I”ll go see anything with . . .
Cary Grant, John Cusack (although Identity tried her loyalty sorely), Steve Buscemi, Wallace and Gromit, Cate Blanchett. Pywackt, a cat who used to be something else until Lizzie sneezed at the zoo one day. Collage. 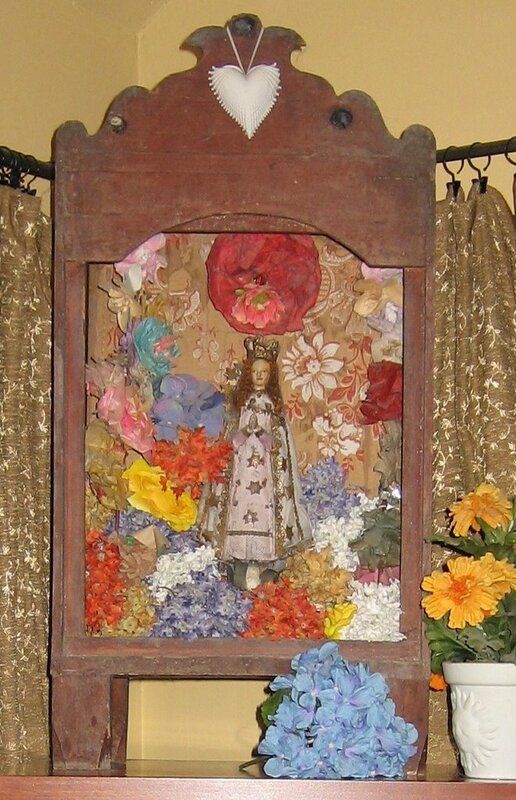 She collages her walls, she collages her chair, she collages her outfits, and now she’s starting to collage old thrift store posters and paintings she’s found. Tries hard not to raid Dee’s art supplies, but sometimes she must. Morgan Le Fay. Only like, you know, good. Kermit, although Animal holds a place dear in her heart. Okay, no, Spike, of course. Spend money like it was water. Clothes, fabric, books, art supplies, anything she wanted, just buy it, even though she knows she ends up with better stuff when she has to work for it and make it herself. A stuffed green velvet frog with gold filigree patterns and a gold crown on its head. She kisses it nightly. Hope springs eternal. I neeeeeeeeed that cute froggie! I really want it! Jen, you find the coolest things and you have the excuse to buy them and get to deduct them for your taxes! Mare is very likeable and I’m intrigued. I can’t wait to see the final product with all of the sisters. And the frog with the filigree! Definitely need one of those. I like the Pywackt backstory. Intriguing. Looking forward to this already. Ah. When I was a child, I used to kiss frogs. As with Mare, ‘hope springs eternal’. Then I thought that maybe as I wasn’t a princess, my kisses wouldn’t work on frogs, so I tried a toad. And then it occurred to me that as I was only a little girl, maybe my kisses would only work on young frogs, so I very carefully kissed a few tadpoles (I didn’t want to swallow one by mistake). My hope stopped springing eternal when someone told me about the infections one could catch from amphibians. Good thing Mare can move objects – if she got an infestation of clothes moths she could just magic them out of the room before they destroyed her fabrics. Can she do the dusting that way too? Or is it easier to move big objects rather than lots of tiny ones? And is that a frog sticking its head out of the cup with the pink rose on it? My brother has a mug with a porcelain frog stuck to the bottom. It surprises people when they get about half-way through their mug of tea/coffee. I love her, I can really see her, this is a fabulous process. Camilla who went to 3 Goodwills today on her lunch break…. Mare sounds great! Coincidentally, I just bought The Chosen Collection – the 40-CD Buffy DVD set. I had to sell my plasma to buy it, but it was worth it. 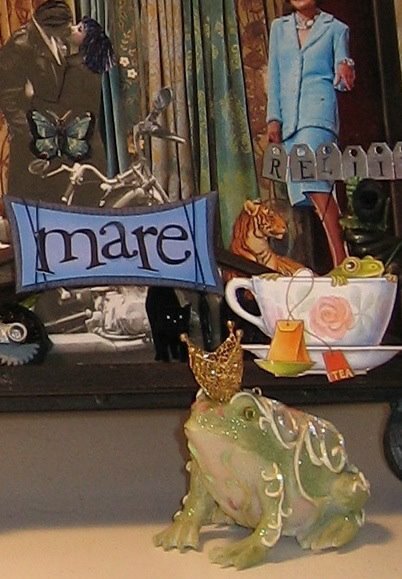 Mare sounds *fantastic. * Does she really wear knee socks with the Keds, though, or are they more like ankle socks? I’ll stop critiquing now. She sounds great. Sounding like a broken record after all the other comments, but Mare already sounds fascinating. It feels like enough info for a whole book. Reading about all the work you (and other authors) go through in your writing process only makes one more appreciative of the final product. BTW, my SIL works at THE WEEK magazine in San Francisco and sells advertising for the magazine. I emailed her to tell her that Mare reads THE WEEK. That was cool to do. Your creative process never ceases to amaze me. It is nice to read your posts and know that there are other writers out there who are visual and create worlds out of the everyday ordinary so well. I must confess, I was reading your description of Mare and found it was a teenage girl that works with me. She changes her haircolor about once a month and knows how to do it so it won’t all fall out. She wears clothes made out of vintage tablecloths and is a Cure fan. But underneath is a kid who looks this way as a defense mechanism and feels stronger when people don’t notice the wild outfits, but accept her for who she is. I can’t wait to read Mare. How facinating. I loved the description of the bedroom because the bedspread that Min owned in Bet Me stayed with me for the longest. Loved the sound of that bedspread! I’m only an inch and a half taller than Mare…I wish I were 140 pounds! 1. Alkaline Trio. Bitter love songs with dry humor and drinking references. I think Mare would really like them. 2. Elton John. I wouldn’t normally say Elton John, but there’s something about his style and originality that reminded me of Mare. 3. Elvis. I know you used Elvis in Bet Me, but when I read Mare, she just screamed Elvis. 4. The Darkness. This band is kind of like Spinal Tap, but serious. Well, not serious, serious. They’re serious about being funny. And being a band. Just listen to Friday Night, Hazel Eyes and I Believe In A Thing Called Love. 5. The Weatherthans. This is young, independent, damn-the-man music. But it’s really good. I can’t wait for Mare! I love the girl already! Now I have Mare’s music on my mind (sorry!). I thought of another one. That’s all. I won’t say anymore. SWEET! Veronica Mars and My Name is Earl! There are people out there that think that I am duranged for liking My Name is Earl. I just find it refreshing and I love Darnell! GO RUBBERBAND MAN… er Crabman! Lots of things to love, but what catches my imagination today is the chair collage. We have a leather facsimile sofa that the cat has carved up a little bit, and now I’m sitting here trying to figure out how exactly one would sew patches to the sofa. What a great idea! And we could have each guest sew his/her own favorite patch to the sofa, and make it a memory sofa — but I wonder if we could sit on it if we did that (-:. Other wonder: do you do rising signs and favorite tarots for all your characters, or just the supernaturally oriented ones? I’ve heard of some people consulting tarot when characterizing . . . .
Oh, Jenny, PLEASE PLEASE PLEASE (huge brown dog pleading dog eyes) tell me in some future blog entry if the familiar Pywackt is a cat and you got his name from Tam Lin by Pamela Dean where one of the college roommates brings home a kitten and they call it the Meebe except for the hero who calls it Pyewacket “but it’s not a name he’ll answer to”. The need to know is like a fever, burning in my veins! Py is from Bell, Book, and Candle. Sorry. The frog is divine! Want one. Pywackt was something else mmmm? Can’t wait! Kelly S. on Questionable: Is Collaborating on a Novel a Good Idea?